A lot of companies have an interesting story to tell about brand. Many also talk about the importance of culture. But this is where I think Red Hat is unique–our brand and culture are practically inseparable. We rarely talk about one without the other. That’s because our brand and culture come from very similar places: The open source way serves as an inspiration and a foundation for who we are. In fact, I’m part of a department within Red Hat that we call People and Brand. It combines the traditional Human Resources organization along with our own Brand Communications + Design group. But to tell this story I usually need to set some context why uniting brand and culture is so important right now. And it begins with a reality check: Companies have less control of the brand messages than ever before. Only a few decades ago, the typical US household had television channels numbering in the single digits. Marketers knew where you were and what you were watching. They also knew the magazines and newspapers you read. So reaching you with their brand messages was pretty simple. It was also a lot harder for you to talk back to the company–or for you to talk to other consumers like you on a mass scale. Today our media choices are nearly infinite. Customers have a stronger voice than ever before. Communities are empowered creators of content. But if your company and its culture are authentic and there isn’t a dissonance between your messages externally, what your customers say about you, and what your employees say about you–then you have a distinct advantage. Why? Because passionate people will help spread your message for you. If you have to rely on advertising to carry a message that isn’t authentic, then you’re going to have to carry a lot of that load yourself. It can be done, but you’ll just have to pay more for it. And there are no guarantees. And how we’re working to give back to the community and share how open source is moving beyond the software world alone with opensource.com. That’s just the beginning. I’ve got another public event coming in January in Raleigh where I’ll be speaking about building brands the open source way. I can’t wait. Stay tuned for details. Great post Jonathan! Red Hat’s approach to business is a model that many organizations could easily shift towards. The alignment of People and Brand at Red Hat enables the organization to deliver on business initiatives … look at the growth it has had in the past 5 years along with being named to the S&P 500 last year! Too often, organizations fail to understand that the brand includes people. The ability to influence bran perception, recall, etc. from a marketing perspective starts with people. The strategic positioning of human resources and marketing as a cohesive unit sets Red Hat apart from the traditional silos of org charts. Kudos! Really appreciate the comment Michael! Thank you and well said. I’m convinced many companies could do the same thing, too. Approaching culture and branding with the same mindset could really help companies understand that their best marketing comes from people who are passionate about the brand–wherever they are. You just have to listen, let them tell their stories, and create an environment that allows those communities of people to connect with each other. Thanks again! I can get behind the idea that passionate people will spread your message for you. Looking forward to hearing more about it. Jonathan, I could not agree with you more. 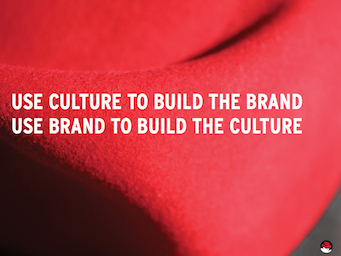 It just makes sense that brand is culture is brand. At the heart of every successful brand is not only its story, but also each individual within its culture that passionately lives and breathes it. Every day. Powerful, consistent and memorable interaction across all touch points. I envision this process as a sphere. Continual and unbroken. Solid and stable. Thanks for sharing! Thanks for the comment, Scott! Agreed. Every interaction companies have with their customers is a chance to build the voice of the brand. I’m always impressed when companies don’t take this for granted and find creative ways to be real and human to their customers. I like your idea of envisioning it as an unbroken process. When people in companies inspire their customers, their customers will give that inspiration energy back to them. Thanks!